Arthur B. (Bull) Hancock Jr. was discharged from the Army when his father’s health required help in running the farm. By 1949, he was in charge. Like his father, Bull Hancock had grown up with the thought that his life’s work would be in the horse business, and summers working in divisions on the farm had prepared him for this. In other seasons he fulfilled educational requirements at Paris schools, Woodberry Forest, and Princeton. In his military service he attained the rank of captain. In 1939 he married Waddell Walker a young lady from Nashville, TN. Bull Hancock (the nickname reflecting a strong persona and deep voice) would develop strong feelings about the potential of a horse. A horse that attracted him as a stallion prospect early in his career was Princequillo. He had a pedigree unfamiliar in America, but he had won from 5 ½ furlongs to two miles. Princequillo was initially acquired for Ellerslie, where he struggled to attract mares at a $250 fee. Ellerslie was sold in 1946, and Princequillo was moved to Claiborne just before his son Prince Simon emerged as a star in England. Princequillo’s was a lasting influence. He sired 65 stakes winners and led the sire list in 1957 and 1958, then graduated to reign as leading broodmare sire a remarkable eight times between 1966 and 1976. A final stamp of greatness was his daughter Somethingroyal, who produced the great Secretariat. PRINCEQUILLO led the Sire List in 1956 and 1957. Another stallion acquisition was Double Jay, who had caught Hancock’s eye winning the Kentucky Jockey Club Stakes as a 2-year-old. Double Jay became a major sire, and Hancock bred eight of his 45 stakes winners; one of them was the farm-raced champion Doubledogdare. Double Jay also led the broodmare sire list three years interspersed amid Princequillo’s years as leader. Princequillo’s offspring included Round Table, who carried the Claiborne colors to victories in Keeneland’s Lafayette Stakes and Breeders’ Futurity at two in 1956. Champions and Leading Sires ROUND TABLE (Bottom, winning the Bluegrass S.) and BOLD RULER (top, winning the Preakness S.) were foaled on the same night in 1954 at Claiborne Farm. Round Table became Horse of the Year and gained renown as perhaps the most versatile American champion in racing surface (dirt and grass), and became the all-time leading earner with $1,749,869. Claiborne welcomed Round Table home for the stud chapter of his career, and he became the leading sire of 1972 siring 83 stakes winners. Howard Keck signed on for this plan for one crop, but business matters prompted him to drop it after that. Hancock was playing golf at Saratoga with show horse and racing proponent William Haggin Perry, and Perry agreed to sign on. It would be a lasting and fruitful arrangement for both parties, for over the year a parade of major winners sprung from the Claiborne fields, half running in the farm colors and half running in Perry’s silks. The Round Table years overlapped with the sagas of Nasrullah, Bold Ruler, et al. Nasrullah fit the pattern of enough speed and class to be the top two-year-old in England, and then showed enough stamina to place in the Epsom Derby at 1 ½ miles. Hancock was among many stallion operators around the world who were entranced, but the horse went to stud in Ireland. After England reduced the value of the pound, changing the complexion of the deal, Hancock was able to acquire the horses in 1950, even years after his retirement from racing, for $320,000. 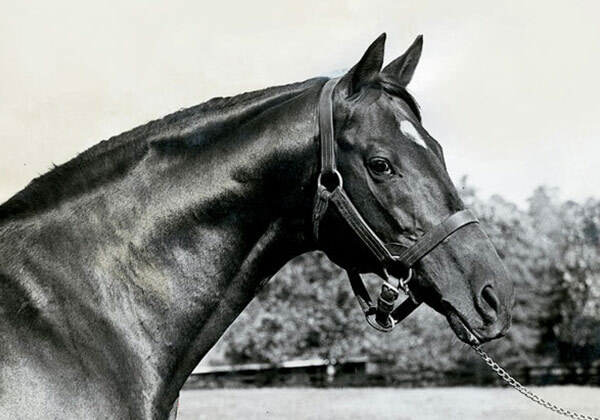 Nasrullah stood at Claiborne for nine years before his death in 1959. He led the sire list five times, one of only three stallions of the 20th Century to lead the list that often. Nasrullah sired a total of nine champions in America, including Nashua, Never Bend, and Bold Ruler, each a major sire in his right. The latter was foaled at Claiborne, born the same night as Round Table in 1954. 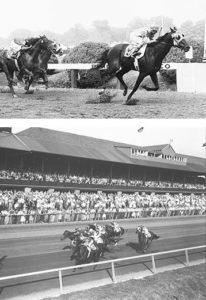 Bred by Mrs. Henry Carnegie Phipps, owner of Wheatley Stable and a Claiborne client for several decades, Bold Ruler was Horse of the Year for Mrs. Phipps in 1957, then retired to Claiborne. He upped the century’s best record by leading the sire list eight times. His son Secretariat placed an additional stamp on Bold Ruler’s prestige and then also had a successful stallion career at Claiborne. Like his father, Bull Hancock generated a large part of his influence from developing relationships with other key breeders, owners, and trainers. These included the various generations of the Phipps family – Mrs. Phipps, her son Ogden, his son and daughter Ogden Mills Phipps and Cynthia Phipps, South African-based precious metals magnate Charles Engelhard, for whom Hancock syndicated and stood the noble Nijinsky II, and Mrs. Martha Gerry, who bred three-time Horse of the Year Forego, by Hancock’s dynamic Argentine import Forli. 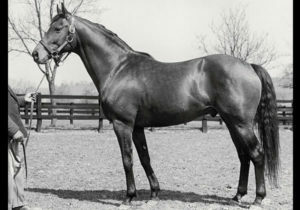 Other major stallions Bull Hancock acquired and managed during at least part of their careers included Buckpasser, Damascus, Ambiorix, Le Fabuleux, Sir Ivor, Tom Rolfe, and Herbager. English Triple Crown winner NIJINSKY II, with groom Clay Arnold, stood his career at Claiborne. Hancock believed in strong female families, and his management of families involved generation to generation success of mares such as the English purchase Rough Shod II. This family produced Claiborne’s homebred Moccasin, champion two-year-old filly in 1965 and the only juvenile filly ever to be voted Horse of the Year. The family also re-crossed the ocean and one member produced the epoch stallion Sadler’s Wells. Another among the long-term producing families for Claiborne was that of Bourtai, which led to Delta, Dike, Bayou, Coastal, and Slew o’ Gold, while other breeders tapped the line to produce Levee, Shuvee, and many more. Like his father, Hancock poured energy and intellect into helping the industry. 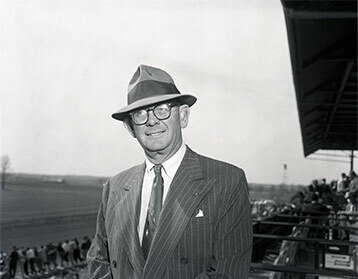 He was one of the original directors of Keeneland and in 1971 was named one of its three trustees. He served on the Kentucky Racing Commission, as did his father and his older son Arthur III. Bull Hancock was instrumental in the merging of the owners and breeders associations to form the Thoroughbred Owners and Breeders Association. He was also a director of the Grayson Foundation, a founder of the Thoroughbred Breeders of Kentucky, and one of the organizers of the American Horse Council. He was a director of Churchill Downs and was among those who stepped up to invest in the track and save it from a corporate takeover. In 1955, Hancock became the first working horseman elected to The Jockey Club, that in an era before the present structure of The Jockey Club which stresses inclusion of working horsemen and horsewomen. He was honored by the Thoroughbred Club America as it’s Honor Guest for the 1960 Testimonial Dinner, an honor also given his father and younger son Seth over the years. Hancock stood the leading sire every year for 15 years, 1955-1969, and under his management Claiborne was the leading breeder four times between 1958 and 1969. 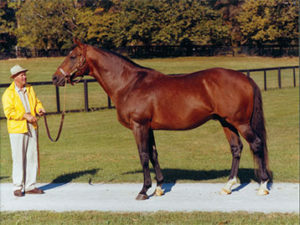 Bull Hancock bred 112 stakes winners including 11 champions in North America and Europe: Doubledogdare, Bayou, Nadir, Round Table, Lamb Chop, Moccasin, Gamely, Wajima, Thatch, Apalachee, and Ivanjica. Hancock was diagnosed with cancer in 1972 and passed away only two weeks later, on Sept. 14.